Huawei have been on the mobile phone manufacturers list for sometime now and have made some pretty big waves, as they rose through the ranks quickly and are well respected as one of the best mobile phone creators on the market offering seriously high end performance handsets that are waited for with bated breath by followers and fans. 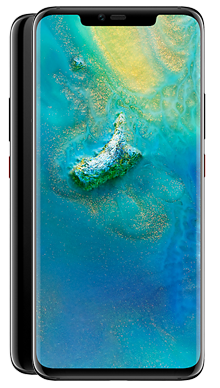 New to the fold and proudly taking its crown as flagship handset the Huawei Mate 20 Pro brings a stunning performance combined with some pretty strong technology to the phone arena. The handset has been making waves since it was announced and pre-orders flooded in, making this a popular choice for many people. Having so many high-end components and offering such a remarkable performance it is easy to see why this is a popular choice for many users, both social and professional. A feature-packed handset tends to come with a price tag to match, and the Huawei Mate 20 Pro is no exception sitting among the top five most expensive handsets with good reason and it certainly won’t put people off. 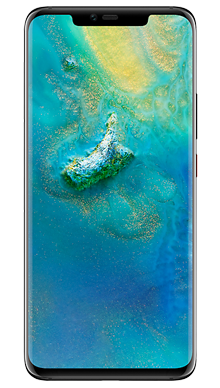 The Huawei Mate 20 Pro is a well-designed handset that has relatively angular corners and an infinity screen that is only interrupted by a small teardrop notch for the front-facing camera. This is a plus size phone, and the biggest on the market at an impressive 6.39 inches. Large phones have seen a surge in popularity again thanks to the ability to maximise the experience of watching movies or playing games. The Huawei Mate 20 Pro features Corning Gorilla glass which helps to add to the robustness and means that you don’t need to immediately freak out if you happen to drop it. There is also the expected level of dust proofing, and in terms of waterproofing, you are looking at a rating of IP68. The display is OLED and offers impressive clarity with 19.5:9 resolution and 539ppi packed into the 1440 x 3210 pixels. When watching movies or simply navigating around we were struck by the true to life colour tones and crispness of the display. Turning the handset over you will find the grid containing the three camera lenses and one flash that make up this triple camera phone. A brand new design, and it does give the phone a nice finish. If you are looking for a handset that offers more than black, then you are in luck as the Huawei Mate 20 Pro comes in two other colours meaning you can own this handset in blue, gold or the obligatory black. As you would expect the sound quality is great. In a quiet room, you will be able to hear the speakers clearly, and the headset performance helps you feel part of your film or game. 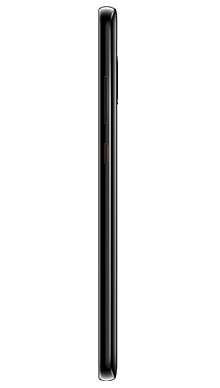 Huawei has chosen to leave the 3.5mm standard headphone jack which is a nice touch. Huawei are already well known for favouring powerful camera technology in their phones that rivals cameras on the high street. While dual cameras have become fairly common now, Huawei has decided to go one better and introduce a third rear lens to the equation. Nestled on the rear of the phone in a quad design with the lenses, they pack a mighty 40MP punch, and the onboard software will help you capture and edit some really great shots. The front-facing ‘selfie’ camera is also larger than one might expect at an impressive 24MP. 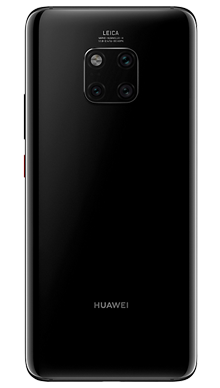 The Huawei Mate 20 Pro has a fingerprint scanner for enhanced security but rather than being on the case of the phone it has been made ‘soft’ in the form of an onscreen scanner meaning no catching the camera lens with dirty hands - a great new design feature. Running the latest Android operating system, version 9, or Android Pie as it has been named, the Huawei Mate 20 Pro is packed with a powerful HiSilicon Kirin 980 chipset. It is an Octa-Core phone which means there is 2.6 GHz, Dual core, Cortex A76 + 1.9 GHz, Dual core, Cortex A76 + 1.8 GHz, Quad core, Cortex A55, pretty impressive to say the least. It packs a powerful punch for dealing with multiple processes or resource hungry games. In terms of battery power Huawei have added some serious muscle with a 4200mAH battery which provides a great power supply and takes you out and about without the need to worry about charging the handset. In terms of memory, you have 128GB built in with an expansion facility to double that meaning you will never be short of space again. The Huawei Mate 20 Pro is a phone that is going to be turning a lot of heads. It has a large price tag which is to be expected with a phone at this level, but you are getting a seriously amazing handset. If you are looking for features, then you will find them all here with everything you could think of packed into this large size handset. Another feature of the phone is the ability to have dual SIM functionally, and you can add two nano SIM cards. Our Metrofone team have been hard at work looking for the best deals they can find and have come up with some brilliant pay monthly phone plans for you when it comes to the Huawei Mate 20 Pro. We asked them to find us a whole bunch, and they certainly did not disappoint. We partner exclusively with EE as our network provider because we want to ensure that our customers have the best in network connectivity and the fastest 4G we can. EE has also got some really great free gifts on offer to new customers which are shown on the deals. 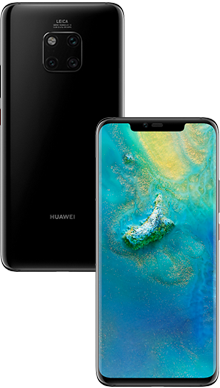 If you have any questions about the Huawei Mate 20 Pro deals we offer or about any of our amazing pay monthly contract plans, SIM only plans or handset only deals then why not call our customer services team on 0333 900 1144, and they will be more than happy to help.